Nippaku suggested Momotaro (桃太郎 / the legendary Peach Boy); Japan Australia suggested momo (もも / peach), Morita Kazuyoshi (森田 一義 / a celebrity also known as Tamori / タモリ), and mofuku (喪服 / a mourning kimono); Jay Dee suggested Morisanchuu (森三中 / a comedy group), Motomachi (元町 / a shopping street in Yokohama, Kobe, Hakodate and Nagasaki), mochi (餅 / rice cake), and MOS Burger (株式会社モスフードサービス / burger chain restaurant); Zooming Japan suggested Momotaro, and Motsu-ji (毛越寺 / a temple in Hiraizumi); and Paul suggested momiji (紅葉 / red maple tree leaves); Mori Minoru (森 稔 / property tycoon, responsible for Mori Tower and the Roppongi Hills complex in Tokyo), Mononoke Hime (もののけ姫 / the Studio Ghibli film Princess Mononoke), MONO (post-rock band), Morning Musume (モーニング娘 / J-pop/idol group), and moe (萌え / otaku/anime/Maid café related slang word). As the weather starts to turn I can feel autumn it on its way. I even had to wear socks in bed last night for a while. When I think of autumn I always think of autumn in Japan, which is just as distinct a season as spring, marked by coloured leaves rather than cherry blossom. The general term for coloured autumn leaves is ‘kouyou’ (紅葉), but you’ll notice that ‘kouyou’ is actually written with the same kanji as ‘momiji’. 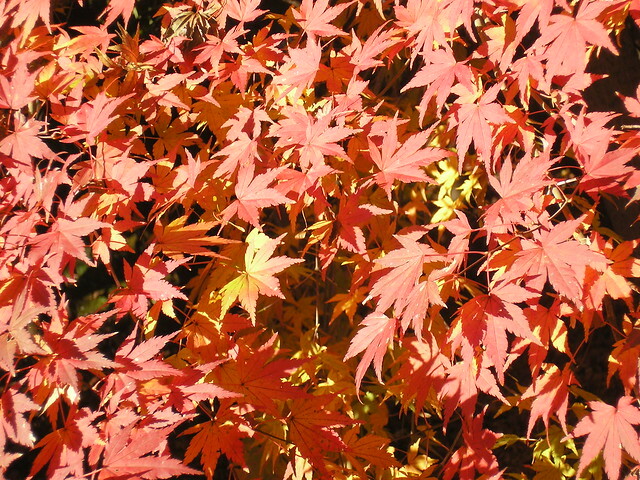 Momiji, as well as referring to coloured autumn leaves, refers specifically to reddened maple leaves, like those in the image above. Just as people go cherry blossom viewing in spring, they go autumn leaf viewing too. This activity is called ‘momiji-gari’ (紅葉狩), which literally means ‘red leaf hunting’. Just as people travel in spring to see cherry blossom, in autumn they flock to the best areas for autumn leaf viewing. Some of the top destinations for momiji-gari are Nikko and Kyoto, although coloured leaves can be seen all over Japan of course. According to this report from 2012, coloured leaves started appearing in Hokkaido in mid-September, by mid-October Nikko was looking good, and by early November it was time to visit Kyoto. Coloured leaves could still be seen in Tokyo and Hakone throughout November, and even into early December. Momiji season lasts a lot longer than cherry blossom season, and it’s much easier to find somewhere good to view the leaves wherever you are in Japan. Momiji maple leaves are also the symbol of Hiroshima Prefecture (including Miyajima), so if you happen to visit that part of Japan look out for momiji souvenirs! 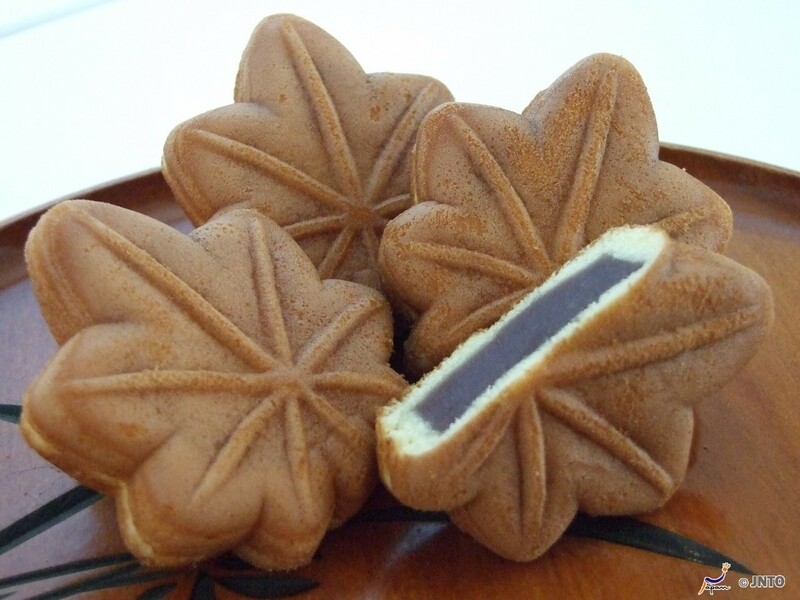 The most famous are momiji-manju, which are a kind of cake filled with sweet red beans. Yum. 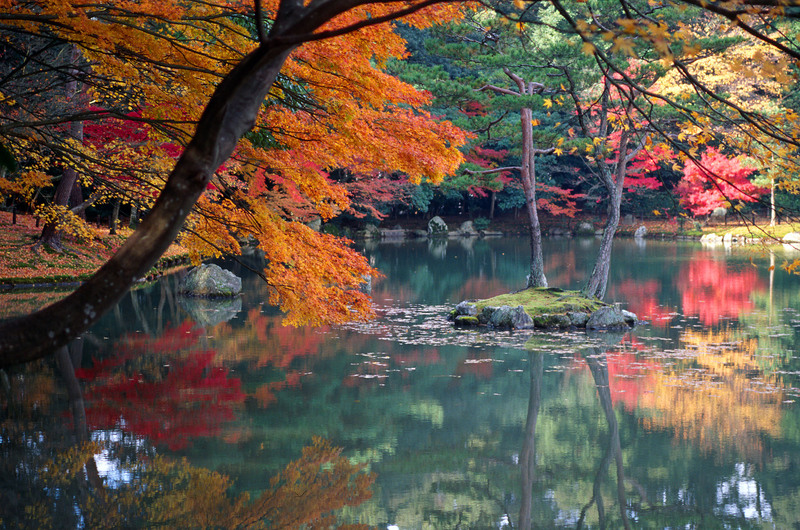 Are you going to do a spot of momiji-gari this autumn? Where are you planning to go? Even though I’m in the UK I’ll still try to go and see some autumn leaves next month. Next week we’ll start with や (ya), so please leave a comment below suggesting a topic for things beginning with や. Topics can be anything, as long as they are connected to Japan – food, places, people, characters, whatever you want to hear about! Just remember that the words you suggest must be Japanese words. Momiji reminds me Japanese Autumn. Typical Japanese Autumn scene. Yes, I can’t believe autumn is just around the corner but it seems it is! I look forward to seeing your autumn photos! Nice post. I think I prefer Momiji season to Sakura season, it’s great for photographs.